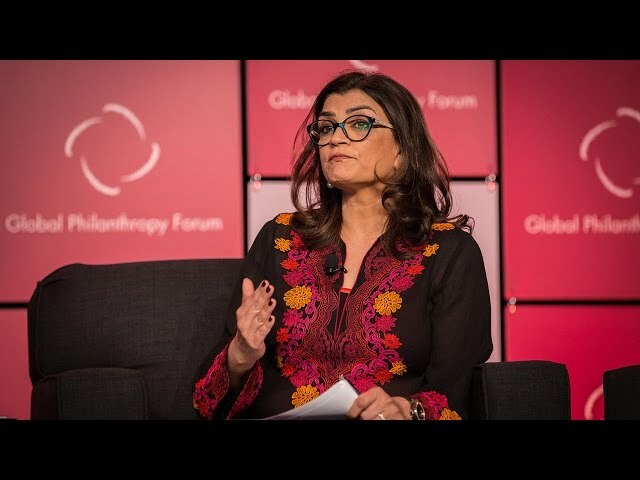 Fayeeza Naqvi is Co-founder and Chairman of the Aman Foundation, a private philanthropic trust headquartered in Karachi, Pakistan. Founded in 2008 by Naqvi and her husband Arif, the foundation is dedicated to transforming lives of the underserved by focusing on the key pillars of health and education. On the health side, the Aman Foundation has long championed the creation of a multitier health system that incorporates community health worker programs, healthcare provision through clinics, and emergency ambulance services. Aman’s approach to education harnesses the entrepreneurial spirit of Pakistan’s youth and through AmanTech, the Foundation’s vocational training institute; they support alignment of Pakistan’s labor force with the expectations of the market. In 2015, Naqvi received the BNP Paribas Grand Prix award, for her philanthropic activity. In 2013 Naqvi signed an MOU with the Gates Foundation and Packard Foundation to launch the US$15 million ‘Sukh’ initiative, to provide women with access to family planning. In 2016, she received the Global Humanitarian Award for Woman’s & Children’s Health, presented by the Bill & Melinda Gates Institute for Population & Reproductive Health at the John Hopkins Bloomberg School of Public Health for this work. Naqvi graduated from the London School of Economics and Political Science. She was a founding Director of Saharay Welfare, established in 2000. She is also a trustee of the British Asian Trust and has recently joined the London School of Economics South Asia Centre as a founding partner and board member. Naqvi is a strong supporter of art across the MENASA regions. She is a member of the Selection Committee for the Abraaj Group Art Prize, a member of the Tate Modern International Council and the Tate Acquisition Committees for the MENASA region.